Enriched with bioactives to create a soothing easily absorbed formula leaving a smooth and matte finish. Hydrates skin with borage oil & shea butter. Caffeine stimulates to reduce the appearance of fatigue. 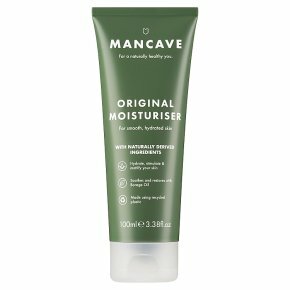 Vegan friendly & cruelty free certified.ManCave's innovative natural face moisturiser is enriched with bioactives to create a soothing easily absorbed formula, which rejuvenates, retextures and helps firm skin leaving a smooth matte finish. As Caffeine stimulates your skin to help reduce the appearance of fatigue, organic Borage oil locks moisture into the cells defending against dryness throughout the day or night. The ManCave hydrating moisturiser is formulated with UV Absorbers and Vitamin E to help protect against free radical damage to the skin. Naturally Hydrate, Mattify and Stimulate Skin with Caffeine, Borage Oil, Shea Butter, Vitamin E and 12 Essential Oils. This product does not contain; parabens, sulphates (SLS SLES), synthetic dye, petrolatum, mineral oils, ingredients from animal sources and is not tested on animals. Directions Apply to face and neck until fully absorbed.